Storewars business simulation courses focus on the main aspects of retailer-manufacturer interactions. We provide a risk-free environment for managers to test and implement executive decisions. We combined 15 of the most useful and effective tools for business planning, assessment and forecasting in one easy-to-use kit. "I would like to say that this game expands your outlook, gives you more knowledge, but I think that to get the most of it you have to play it more than once." "Excellent Business simulation. Helps one understand negotiations through hands on decision making. Lots of info- critical to develop & execute strategy." "Being in the shoes of retailer helps me to see and understand their perspective and the ability to be in a multinational team helped to widen my perspective." 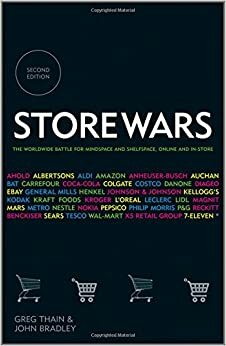 Completely revised and updated, Store Wars brings right up to date the struggle between manufacturers and retailers for control of MINDSPACE and SHELFSPACE in developed markets, emerging markets and the internet. Available in English, Russian and Chinese.